The Borzoi is a proud, dignified dog and highly intelligent. He can be aloof, but this should not be mistaken for shyness. He is loyal to his kennel mates and owner, and is exceptionally clean in his habits, being easily house trained. However, it must be remembered that he is a hunter at heart and consequently nothing gives him more pleasure than to chase a quarry. This is his nature and he should not be penalised for it. Owners need to understand this and act accordingly. If they cannot understand his nature, they would be better advised to own a different breed. As a companion, the Borzoi is wonderful, though they do prefer a somewhat laidback relationship with their owners. They usually work out what is required of them indoors, and, provided it is their choice of settee, will settle comfortably until it is time to go out. Borzoi are not for everyone, and are often standoffish with strangers. They dislike pushiness, preferring to make friends with you, not you with them. Anyone wanting one should spend time visiting other owners and kennels before making what is a very important decision, because once you have one your life will change - they are very addictive and most people end up with more than one. Then before they know it their lives are changing to suit their dogs, which is indicative of the Borzoi's charisma. Borzoi owners generally move house shortly after getting their first dog - to get more space (though this is not a necessity for the breed), better facilities etc. They rarely holiday unless they have a dog sitter or leave another Borzoi friend to care for their dogs, preferring not to leave them in kennels where their sensitive nature may not be understood. Living with a Borzoi seems like a love affair, where you can't bear to be parted for any length of time. Borzoi are not for everyone. They will not tolerate loud mouthed, aggressive people and will not respond to being ordered around or being treated like a dog. After centuries of special attention as valuable companions, they expect to be treated with respect and love. Given understanding, friendship, equality in the family and gentle training, a Borzoi is a devoted companion prepared to do anything (provided it does not upset his dignity) just for the fun of it. Borzoi like comfort - your bed or best lounge chair preferred – and they make excellent house dogs. They do not have a dog smell and will keep quietly in their favorite spot out of the way for hours. They rarely bark. If they do, check to see what is wrong. There is one Borzoi on record that never made a sound but once had an intruder bailed up for 3 hours until the owner came home. Borzoi are highly intelligent animals generally quick to learn but can be obstinate if treated the wrong way. In the centuries of history, they had to make their own quick decisions while hunting out of sight of their owner. When training, Borzoi should be ‘asked nicely’ and encouraged. Try to force them or punish them and they will never do anything for you and will probably embarrass you as well. They can scream their heads off if hurt. For the right person, a Borzoi is a delight to own and many new owners wonder why they didn't get a Borzoi years ago. The Borzoi is a very tractable animal willing to fit in with any family arrangement. 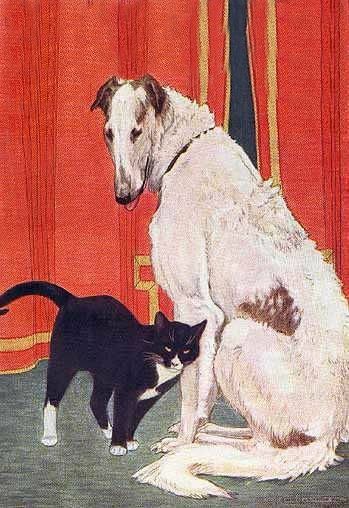 Although a hunting breed, a Borzoi that grows up with a cat or other animals will be quite friendly with it and will even lie down to play gently with something small. Some years ago, one club member had a Borzoi which was quite happy to eat from the same dish as a litter of Cocker Spaniel puppies, 6 cats, a magpie with a broken wing and an ex racing greyhound. Outside the home environment, a Borzoi's hunting instincts are still sharp and they will chase the neighbourhood mongrel or the neighbour's cat if it runs. Borzoi owners should be aware of their hound's hunting ability even if he does sleep with the family cat.